This is, at the moment, Santiago's most famous karaoke pub. It's called "Playback Studio" and has two branches in the city. The one in the picture is located at the Boulevard del Parque, next to a shopping mall. 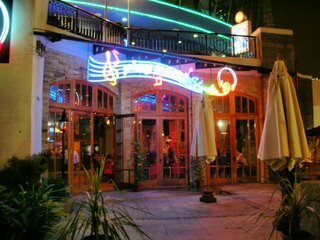 Hi Edu, is Penelope again, i've been there a couple of times and it's a very funny place, so if some of you are planning a trip to Chile don't forget to go, you'll have a nice time singing and drinking a famous Chilean "Pisco sour"! Thanks for this information about the Playback Studio...I'm chilean and I didn't even know this place existed...I've only been at the Flannery's and compared to the Karaokes in the UK, this one is boring because they haven't updated the songs list.